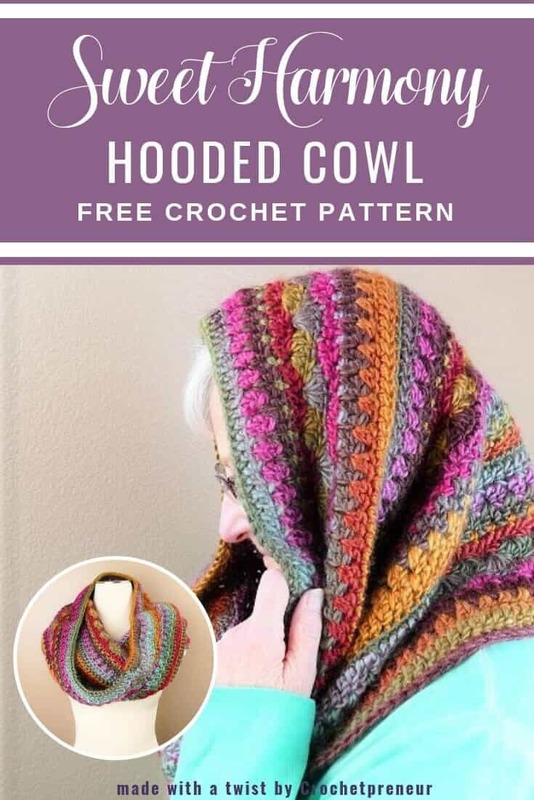 I’ve been wanting to design a hooded cowl crochet pattern for quite some time and I finally took the leap when I was trying to think of the perfect gift for my mom this past Christmas. Full of interest with texture, color, and softness, this wide cowl can be worn as an infinity scarf or as a head wrap. Elegant enough for evening, but comfy and warm enough for everyday, this hooded cowl is called Sweet Harmony because of the soothing touch and delightful design of this self-striping yarn from Lion Brand. You can use your favorite self-striping yarn to make this beauty or go for a more subtle charm with a soft solid. It’s all up to you! 550 yards worsted weight, size 4, yarn. I used 4 skeins of Lion Brand Landscapes (3.5 oz/100g, 147 yd/134m, 100% acrylic) in the Desert Spring colorway. No matter your skill level, read through the pattern before beginning your work just to be sure you don’t have any questions that might cause frustration in midst of your project. Gauge: 3.5 rows X 7 stitches = 2” square worked in double crochet rows. Adjustments: To adjust sizing add or subtract six stitches from the foundation round and adjust stitch-count of subsequent rows. Shell Stitch: To make a 5-DC shell, work 5 double crochet stitches into a single stitch. RNDS 14 – 25: Repeat RNDS 2 – 13. Copyright notice: This pattern and its images are copyright protected and the sole property of Made with a Twist by Crochetpreneur®, a division of Montgomery Grice Enterprises, Inc. Please do not redistribute, transfer, or sell the pattern, or alter it to claim as your own You may sell any products you create from this pattern. Please credit the designer by linking online listings to www.madewithatwist.com or tagging @madewithatwist. Be sure to link your Ravelry projects to the <<insert pattern link here>>> and use the hashtag #madewithatwisters when you tag @thecrochetpreneur and @madewithatwist on Instagram. I am not usually interested in cowls, but I really like this one! Added it to my Ravelry list. Thank you, Stace! I hope you enjoy making it…and wearing it! This is such a beautiful cowl! I love the colors! I’d like to invite you to share this (and another other crafty creations) at the next Snickerdoodle Create Bake Make Link Party. The party goes live at 5pm EST at SewCraftyCrochet.com. I hope to see you there!!!! Thank you so much for your kind words. I love this free cowl pattern – self-striping yarn is my new favorite thing! I appreciate you sharing your Snickerdoodle Create Bake Make link party. I’m going to write it down and try to catch it next week!